Deb's Cup of Tea: This is something of a 'no-brainer'. M&M/Mars is having this contest to find the best M&M. 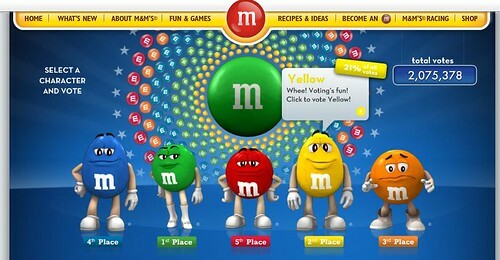 Of course I would vote and, of course, I would vote for yellow; M&M's with peanuts. The contest runs through July 15th and, every day, there is a chance to win a prize, that's assuming you remember to vote. If you're on Facebook, you've seen my empassioned pleas for people to vote for yellow. I have no M&M's in the office. They are all gone. I think a trip to the grocery is in order.